Let us take care of your “bear” necessities! 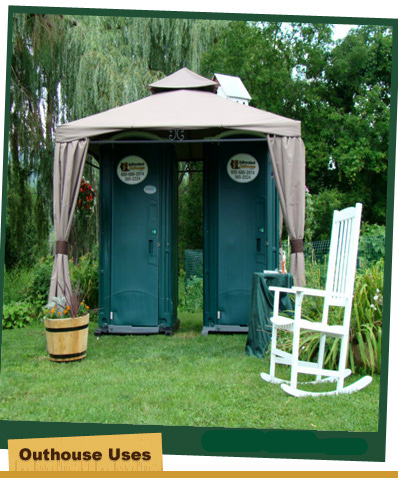 Adirondack Outhouses by Tyler is a full service portable restroom company. We offer quality products and service for all your outdoor sanitation needs. We supply a variety of portable restroom styles including standard & construction units, flushable units for weddings and special occasions, handicap units for your special needs guests or employees, as well as free standing wash stations. Short term and long term rental contracts are available, and our courteous office staff will work with you to ensure the right number and style units for your event. Please call us at 1-800-688-2974 or contact us online for more information or to request our services. Storage on the spot, 8'x8'x20' storage container unit. Residential- Contractors - Commercial. Delivered to you or rent on our site. We are centrally located in Ticonderoga, NY. Call 1-800-688-2974 for reasonable rates! Copyright 2017. Condit Brothers, LLC. All rights reserved. Website Design and Search Engine Marketing by Mannix Marketing Inc.